We print our Barcoded Roll Tickets in bright colors on white paper stock in rolls of 1000 tickets. 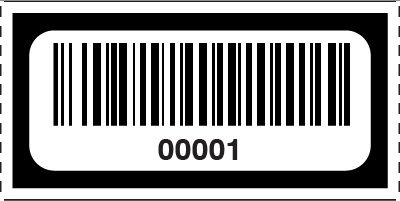 Each 1" by 2" ticket has an easy to scan barcode (type 3 of 9 also known as barcode 39) and a human readable text number below that corresponds. Each roll is sequentially numbered. Custom start numbers can be requested by contacting our sales staff. The backside of the ticket has a watermark security feature.